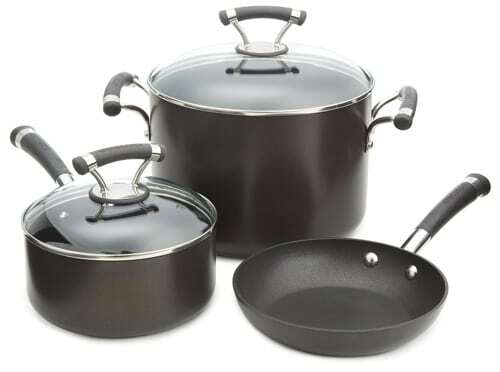 Prepare for an enjoyable cooking experience with the Circulon Contempo Hard Anodized Nonstick 10-Piece Cookware Set. 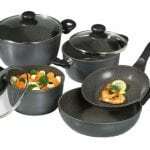 It stands out among all the other cookware sets because of its well-thought components and high standards of manufacture. This set does not offer any new features, but the most useful ones. Every aspect of this set makes your job easier and it significantly reduces the amount of time you spend in the kitchen. 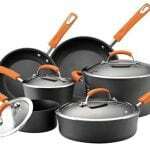 In addition, your level of satisfaction will increase as soon as you will see for yourself that the Circulon Contempo Hard Anodized Nonstick 10-Piece Cookware Set is ideal for your needs. The hard anodized feature is translated in a product with high durability, which can be used over and over again without any problems. The top coat and the interior finish are resistant to all the common kitchen dangers. The interiors of every component are even resistant to utensils made of metal. Also, the handles come with a rubber finish. This is a necessary feature because the risk of burning your hands is eliminated. The end results of all your cooking efforts are favored by this cookware set. Your food can simply not stick on any of the pans or skillets. You can expect your food to be cooked evenly and all the nutrients to be retained thanks to the special lids. Circulon is a pioneer in the cookware industry. For over 25 years, Circulon was the first company to develop manufacturing technologies, such as the nonstick DuPont Autograph. Since 1985, Circulon has focused on meeting the needs of every person who cooks regularly at home. Their targets are also set on providing cookware that retains the vitamins from vegetables and other ingredients as much as possible. Their strategies include unique cooking surfaces that enable cooking processes without the usage of oils, fats or even water. The Total Food Release system is a patented system of Circulon, which is all about delivering durable and abrasion-free pieces. 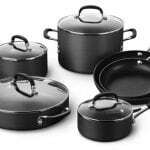 Different dimensions and purposes – Among the 10 pieces are saucepans that come in 2 sizes, a huge stockpot, a medium straight sided saute pan and skillets that also come in 2 sizes. High-Low wave technology – This technology is patented by Circulon Contempo and it ensures a long life to the non-stick layers. Your gourmet meals will not be partially stuck to the bottom of the pans. 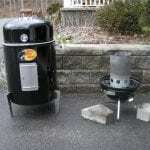 Non-existent hot spots – Cooking evenly has never been easier. You do not have to move the food from one side to another to avoid it to be faintly cooked. 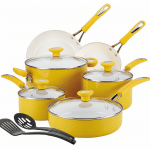 Heavy gauge feature – This cookware set is designed to last a lifetime. Misaligned fit of the handles – This is more a design flaw than a flaw that makes cooking uncomfortable in any way. 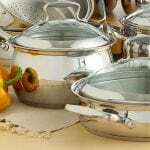 Not dishwasher safe – The cookware from this set must be washed by hand to prevent damages. 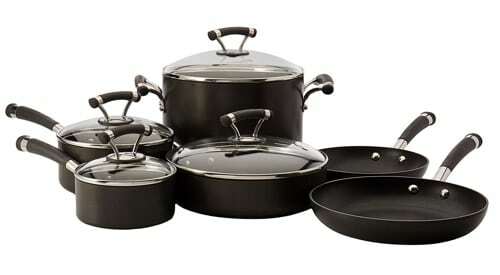 The Circulon Contempo Hard Anodized Nonstick 10-Piece Cookware Set offers the best cooking experiences for its price. It does not have flaws when it comes to durability and it excels at its non-stick feature. It is a very useful set that can meet anyone’s needs for preparing mouthwatering dishes.